When used with a bit of caution and common sense under proper adult supervision, bicycles can be an excellent way for children to get some exercise, develop gross motor control, and burn off all that energy. But they are not without their risks. Possible injuries that can be caused while bike riding include cuts, bruises, pinches, sprains and strains, broken bones and fractures, head injuries including concussions, and even death. The Consumer Product Safety Commission’s (CPSC) National Electronic Injury Surveillance System (NEISS) estimates there were nearly 240,000 reported cases of injuries to children under the age of 18 caused by bicycles and tricycles that were treated in hospital in the United States in 2014. The number of actual injuries caused by bicycles is likely to be quite higher than this, as the data from the CPSC reporting system only looked at those injuries which resulted in medical treatment at one of 100 participating hospitals, and minor injuries were likely treated at home or another medical treatment facility not included in the reporting data. Always be sure to follow the manufacturer’s instructions for use and ensure your child is wearing an approved helmet when riding their bike, even if it’s just a short distance. Three quarters of all American children ride a bike each month, but only about half wear a helmet every time they do so. Wearing a helmet is the easiest and most effective way to reduce bike-related head injuries. Your child should also wear visible clothing, use lights at night, and follow the rules of the road when riding with traffic. 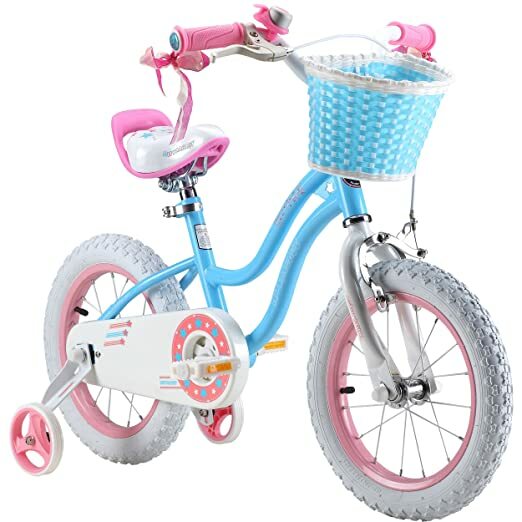 This bike boasts a heavy duty stainless steel frame and fork that provide added stability for your little one when on the road. 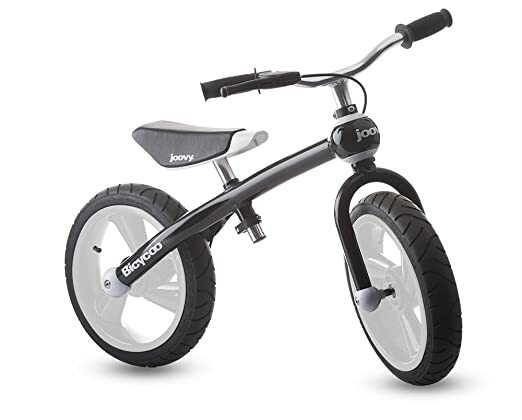 It also has coaster brakes to help your child stop with even more precision. 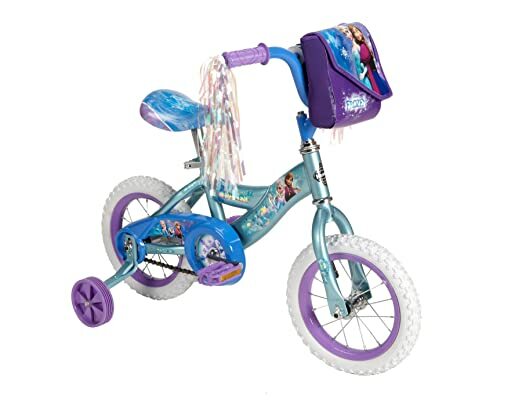 Perfect for the Elsa and Anna lover in your life, this bicycle has a solid and sturdy steel frame and comes with a bonus removable Frozen-themed fashion bag to pack lunch or other important items. This super cool Star Wars rebels bicycle features a sturdy steel Y frame and even makes sounds effects to send your little rebel on their way. 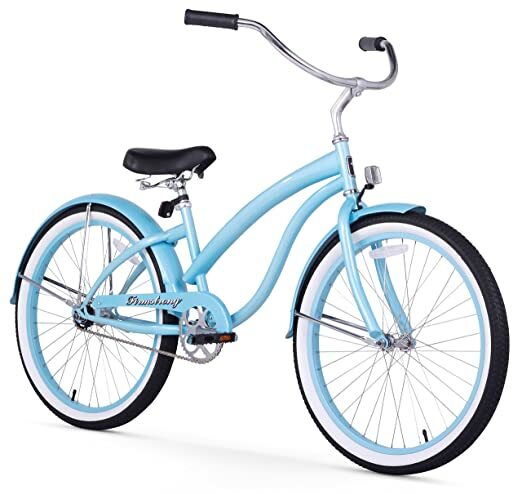 This brightly-colored bicycle features a durable and sturdy steel frame as well as a suspension fork for added riding comfort. The spoke aluminum wheels are rugged and ready for any terrain your child wants to ride on. 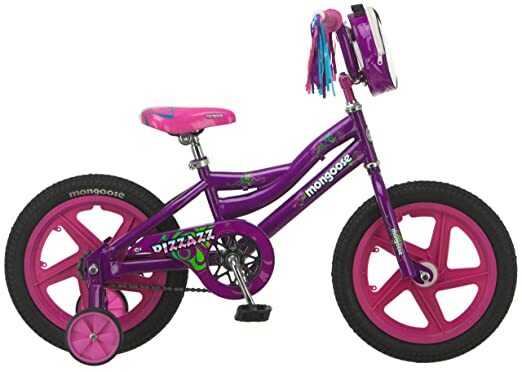 This sweet little cruiser is full of pizazz to make your little one the coolest looking rider on the block and features a quick release seat for easy adjustments as your child grows. 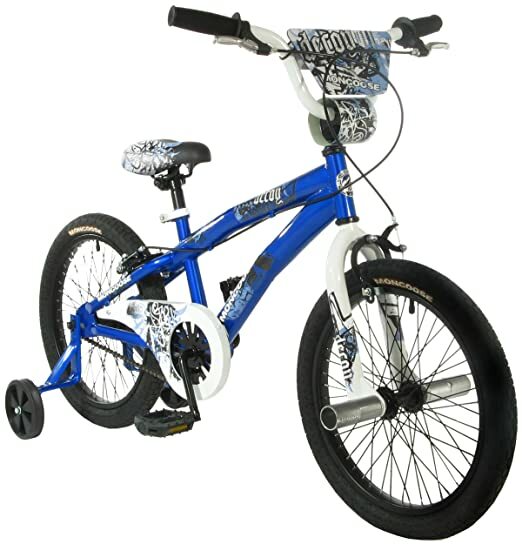 This bicycle features a steel BMX frame for the ultimate in durability and stability. The quick release seat makes for easy adjustments as your child grows. 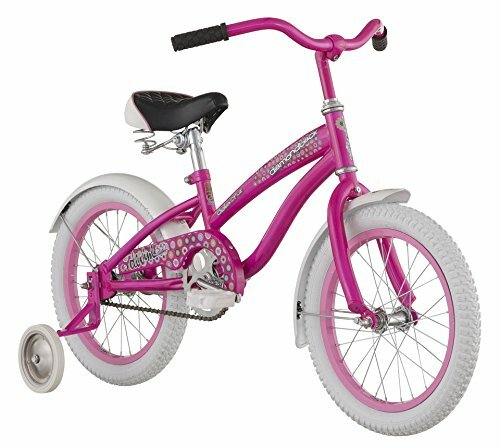 This stylish princess-themed bicycle boasts an included doll seat, a basket, and streamers for a complete stylish look. The bike comes nearly fully assembled so your child can get riding nearly right out of the box. 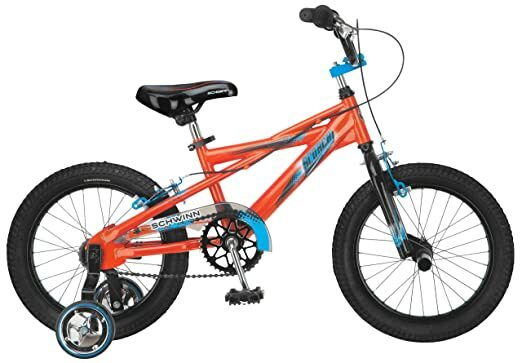 This trail mountain bike features a high tensile steel frame that provides added durability and a suspension fork to absorb shocks and bumps as your child hits the trails. 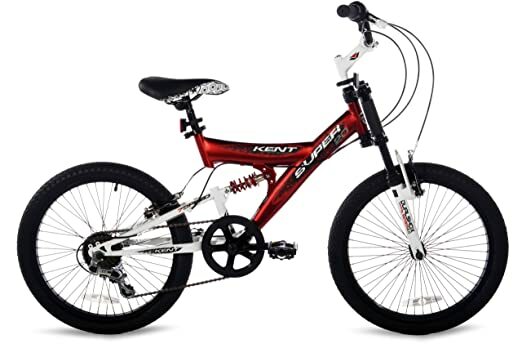 Ideal for both boys and girls, this sports bicycle comes with a bell, tools, and water bottle for a complete riding solution. The quick release seatpost makes is easy to adjust the seat height as your little one grows. This bicycle is the perfect option for the Power Rangers fan in your life and features deluxe paint and graphics for cool styling. Handlebar shield is included for added protection. 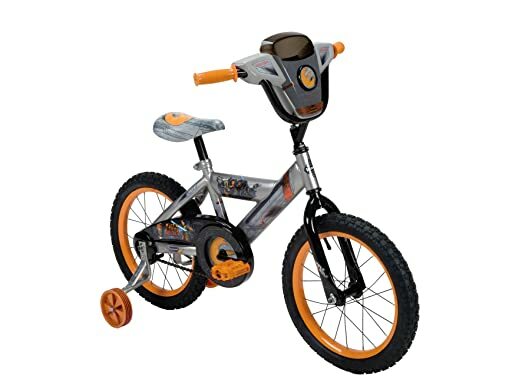 This sweet ride features a durable heavy duty steel frame that’s built to handle whatever roads your child rides on and comes with a padded seat for additional riding comfort. 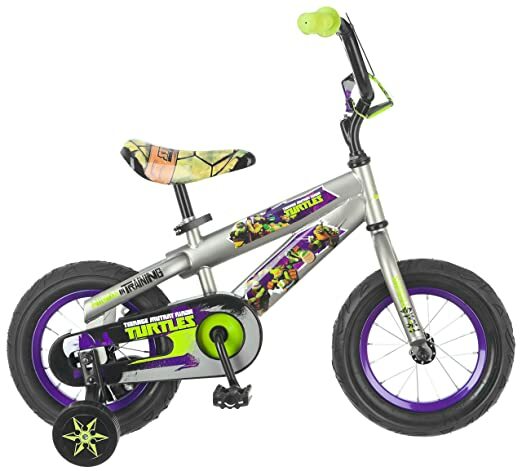 This cool set of wheels features a complete set of Ninja Turtle graphics that’s sure to impress their biggest fan. 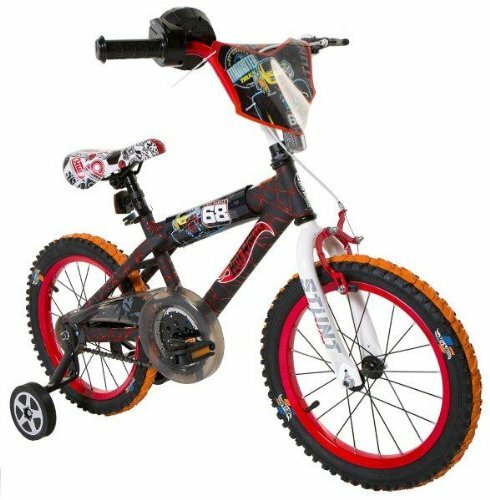 Your child will be one totally awesome dude with this bicycle. Pizza not included. Balance bikes are growing in popularity as a safe way to teach children the basics of riding and staying upright on a bicycle. This unit is one of the most popular ones available. 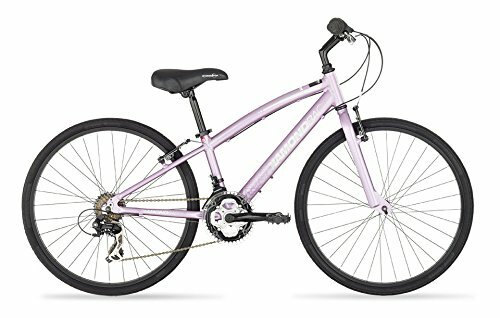 This classically-styled pink and white bike for girls features a sporty German design along with impact-resistant metallic paint. It comes complete with a bell, rear rack and front basket for a complete package in one. The Radio Flyer classic gets an update in this bicycle and is available in a choice of two colors for both little boys and girls. It comes complete with a ringing bell, streamers and removable training wheels for added safety and stability. 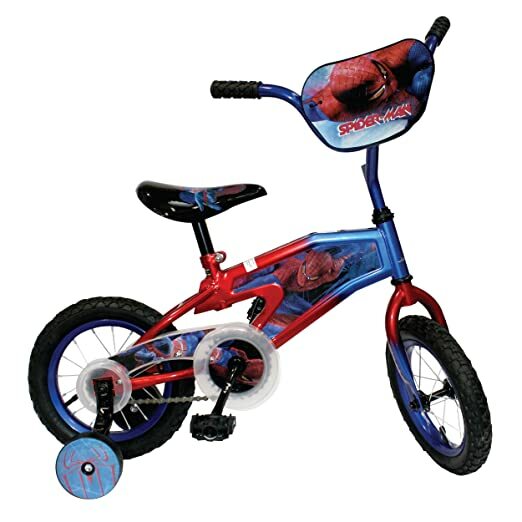 Spiderman, Spiderman, rides wherever this Spiderman bike can take him. Graphics on the faceplate, body and seat give this bicycle a stylish look. The solid, durable steel frame and padded seat provide a comfortable ride. 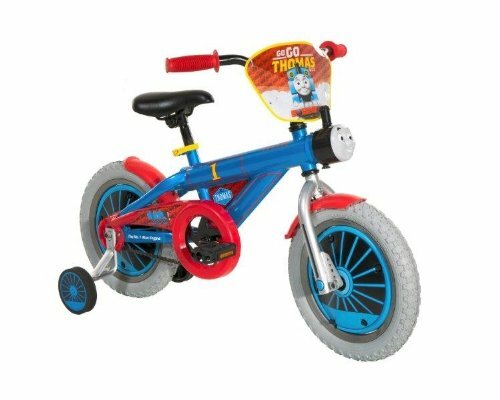 This bicycle is ideal for your little Thomas the Train fan and features deluxe graphics and painting styled just like Thomas himself. This stylish two-wheeler features 20 inch wheels and a quick release seat that easily adjusts as your child grows. Thanks to the fully welded dual suspension steel frame and front suspension fork, your child will have a smooth and comfortable ride. This fashionable cruiser features a curvy design that’s easy to get on and off and is easy on the eyes as well. 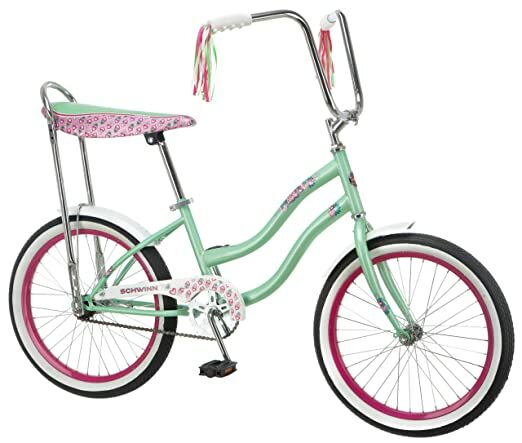 Hawaiian floral decals on the frame and chain guard provide an added touch of style. This sleek and stylish road bike offers a lightweight riding solution for your budding Lance Armstrong. 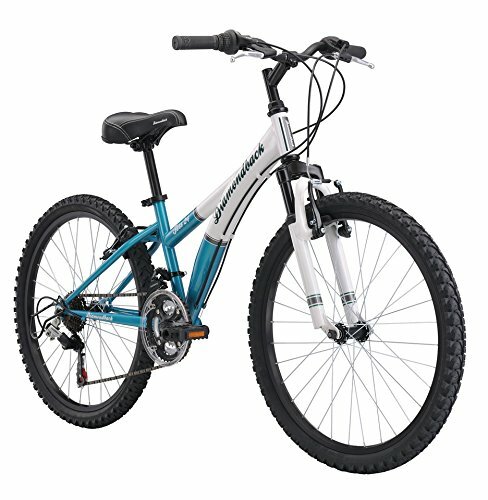 Its durable alloy frame will last for years of on-road riding. 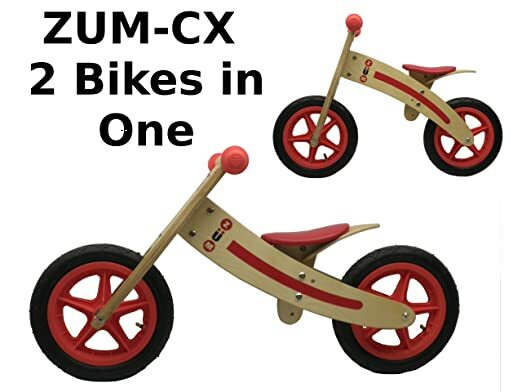 This cute little wooden balance bike can be assembled in such as way that it provides two bikes in one. Suitable for children aged 2-6, there are no pedals and no brakes to worry about. 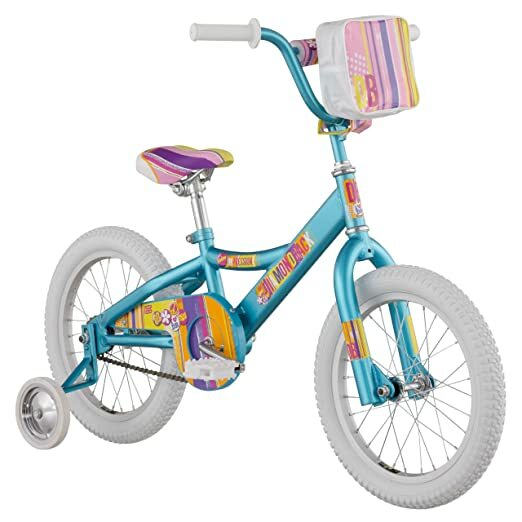 This colorful bike features a TIG welded steel frame and fork for the ultimate in durability and comes with wide, knobby tires to provide a smooth and comfortable ride for your child. 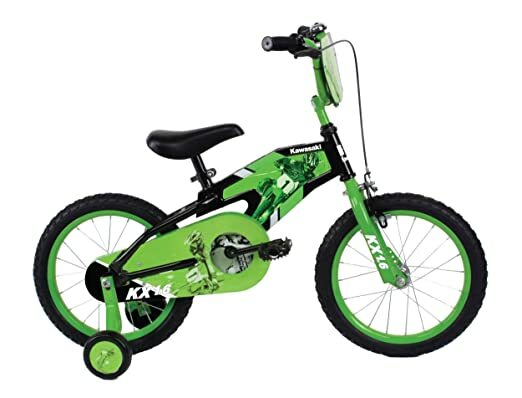 This bicycle in classic Kawasaki green is a favorite of little boys and features a steel frame for a tough and durable ride. 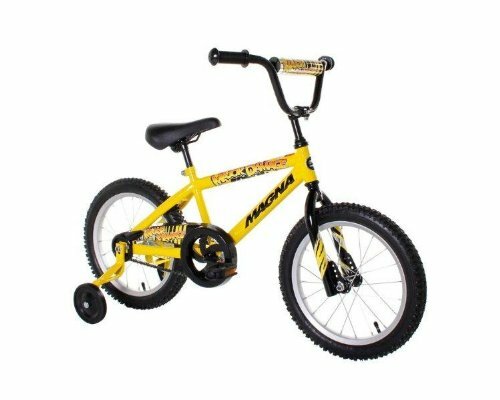 Suitable for children aged 4-8, it features both hand and coaster brakes to help your child stop on a dime. 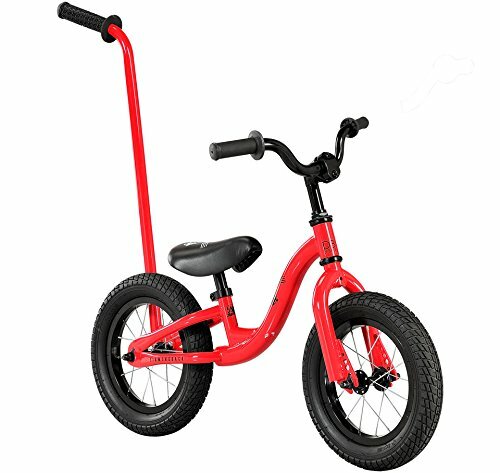 This sleek ride features a BMX seat and front pegs to help little tricksters nail all their moves. 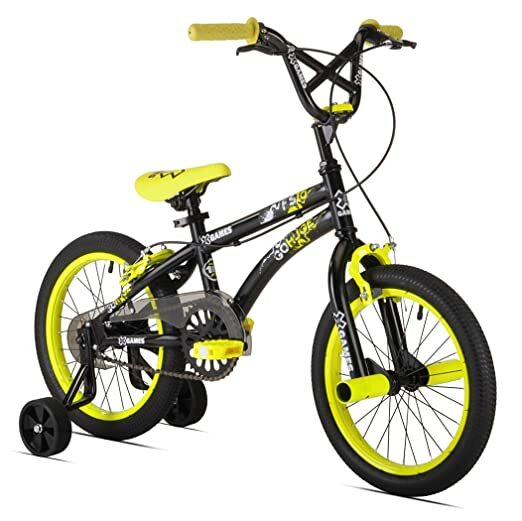 It features both front hand and rear coaster brakes to help your child stop on a dime. This stylish bike is the perfect beginner’s cycle to get your little one used to riding on two wheels. It is single speed and features comfortable mushroom-style grips. Its durable steel frame and pneumatic tires are designed to last. This is one sweet ride for your little cyclist just learning to ride. There are no pedals or brakes to worry about, and the bicycle can be adjusted for children from 18 months up to 5 years of age with ease. 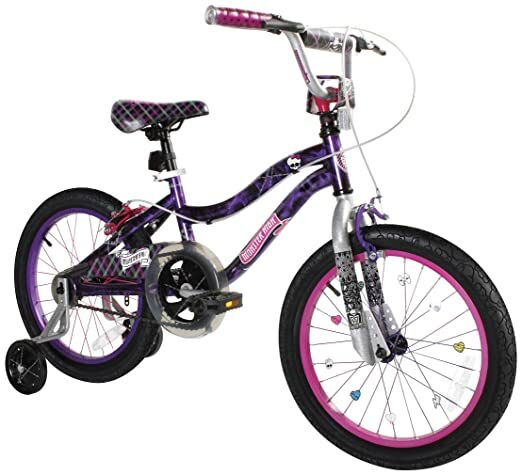 This bicycle features graphics, designs and stylings from Monster High and boasts a BMX frame that’s easy to ride. 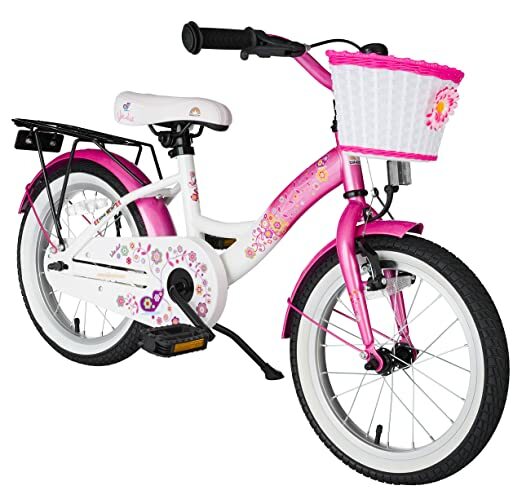 It features front hand brakes and a rear coaster brake to help your child stop with ease. 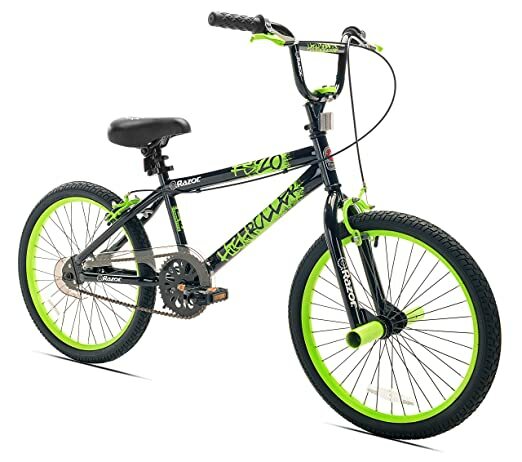 This bike features styling in classic John Deere green and a durable heavy-duty steel frame. 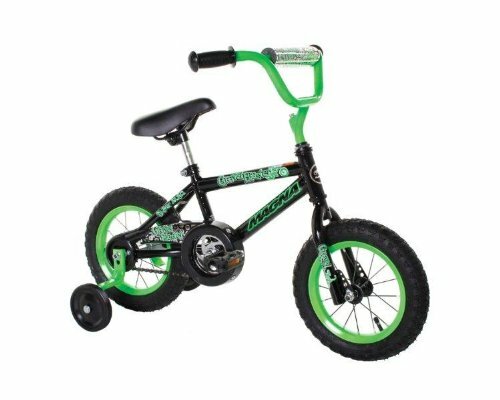 Front shocks provide a comfortable ride while the front hand and rear coaster brakes ensure you child can stop on a dime. This super stylish bicycle looks just like a dirt bike and features a durable steel fork, frame and motocross-style seat for a comfortable ride. It assembles in just 30 minutes, so your child can hit the pavement in no time. 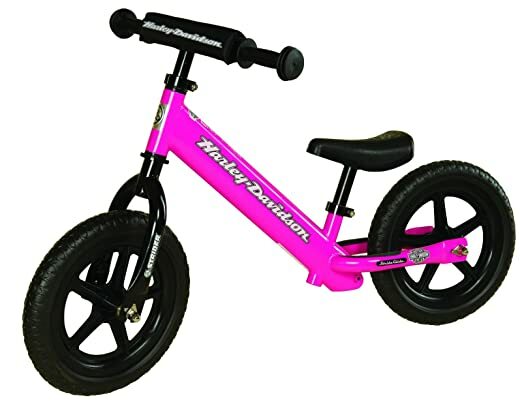 This stylish-looking balance bike features no pedals to trip up beginner riders and is available in a choice of 3 colors to suit nearly any little rider’s style. 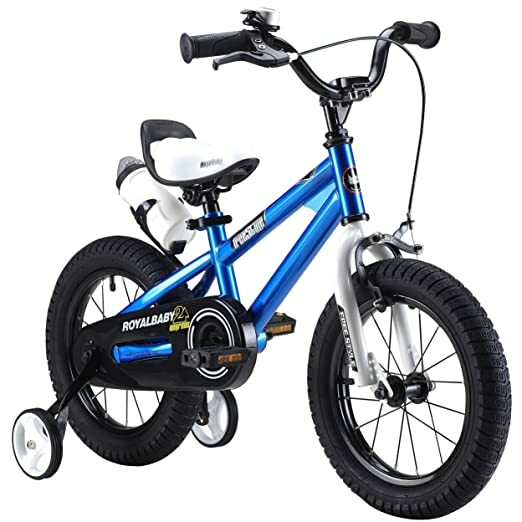 Suitable for children aged 3-5, the durable aluminum frame is built for years of use. 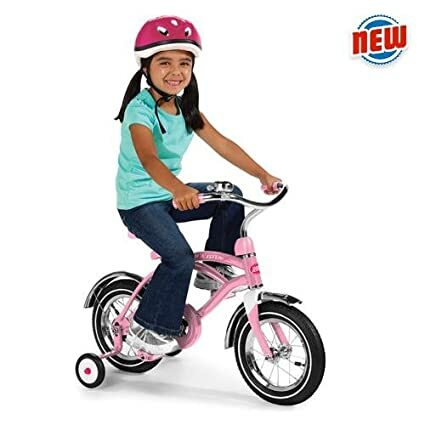 Ideal for beginner riders, this stylish pink and white bicycle features a dual braking system for added security and is easy to assemble out of the box. The durable steel frame is built to last. 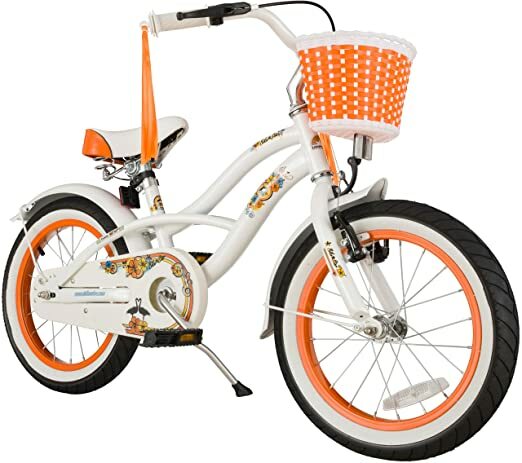 This sporty bicycle is perfect for the Hot Wheels or race fan in your life and features decals and deluxe frame with finish in Hot Wheels motif. 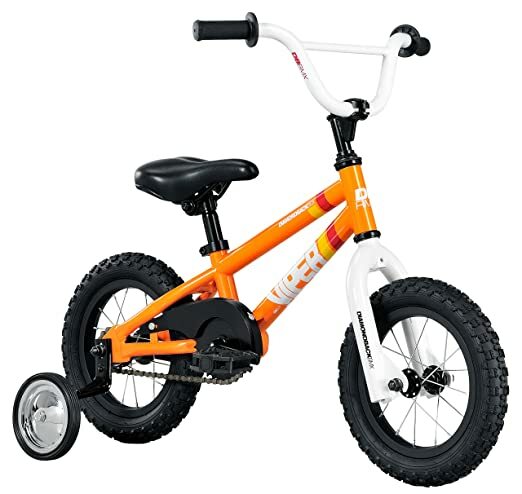 Suitable for children aged 5-7, it even features a toy speedometer on the handlebars. This sweet little ride features a durable high tensile steel frame and fork and boasts a quick release seat that’s easy to adjust as your child grows. The bike frame even comes with a limited warranty. This super stylish cruiser offers a modern twist on a classic design and features impact-resistant paint that can stand up to what your child might put it through. A bell, tassels, basket and side kickstand are included with this model. 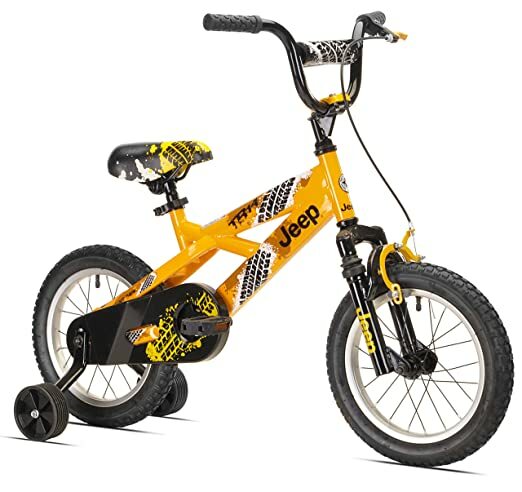 This Jeep-themed bicycle features rad styling and a durable steel frame with suspension fork for a comfortable ride. 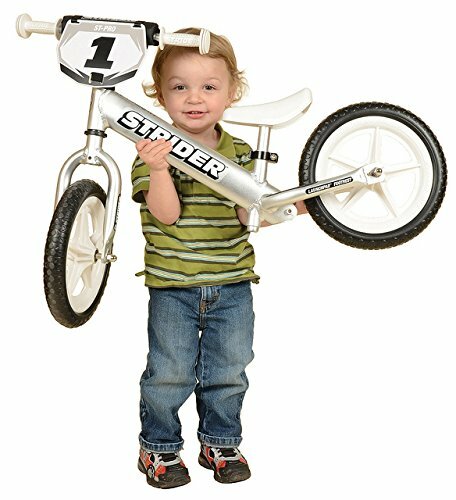 Training wheels are included and the quick release seat clamp makes adjustments a breeze as your child grows. 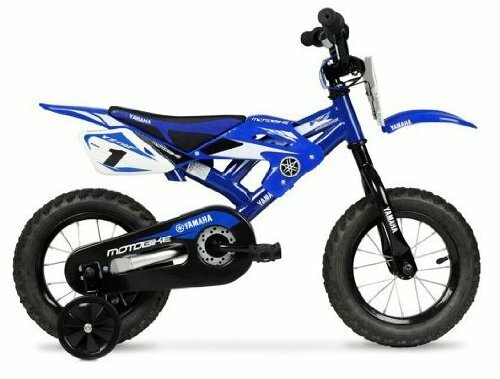 This stylin’ balance bike is available in a choice of 3 colors to suit nearly any little cruiser’s tastes and is made from a durable aluminum frame. Extra wide tires provide added stability to your child’s ride. 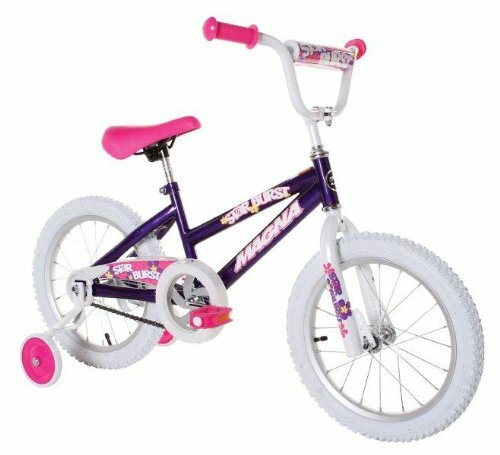 This cool set of wheels features a BMX padded saddle for a comfortable ride and coaster brakes for reliable stopping power. The lowered top tube makes for easier stand over clearance and a more comfortable ride. This stylish cruiser features a full detail of Hello Kitty decals and motifs along with a durable, steel frame that’s built to last. Suitable for those aged 12 and up. 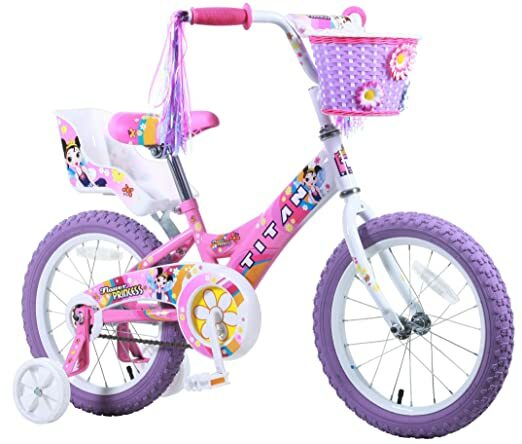 This bright and colorful bicycle is a cheerful way for your little one to get in some exercise and comes complete with a handbag on the front for storing their lunch or other important items. 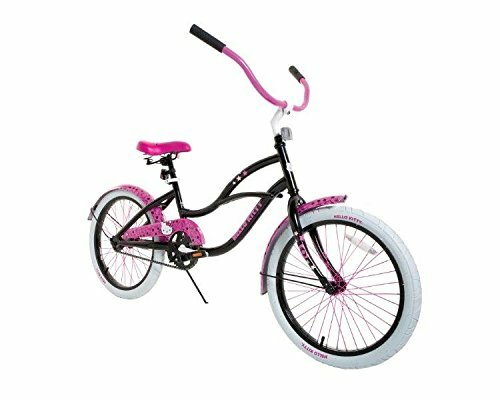 This mini cruiser bicycle features a high tensile steel frame that’s durable and made to last, with a stylish classic cruiser ‘tank’ top tube design in a bold pink hue that’s sure to impress. This bicycle features Schwinn’s classic frame in a retro mint green color. Thanks to the low stand over, it offers an easy on and off for beginner riders and comes complete with a banana seat and tassels. 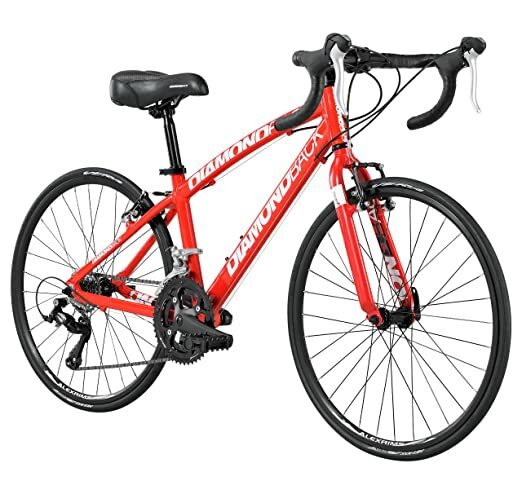 This sleek bike boasts a durable alloy frame with a derailleur hanger that is replaceable for added longevity. 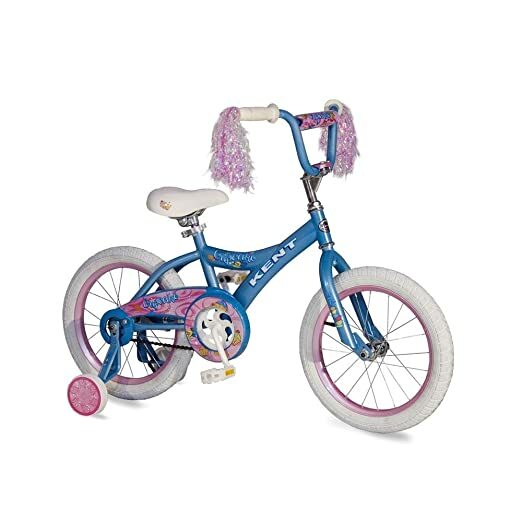 Suitable for children aged 9-12, this road bike will have your little one cruising the neighborhood in style. 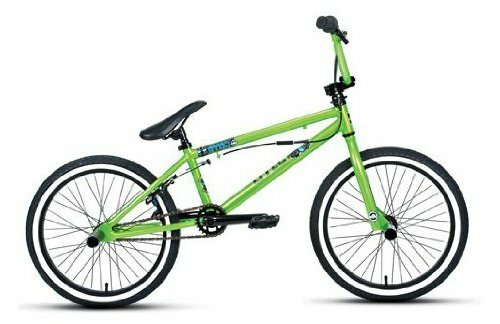 This sturdy bike features a number of BMX stylings to provide both a comfortable and durable ride for years to come. Safety pads are included on the handlebars for added protection, and the seat is padded for a quality ride. 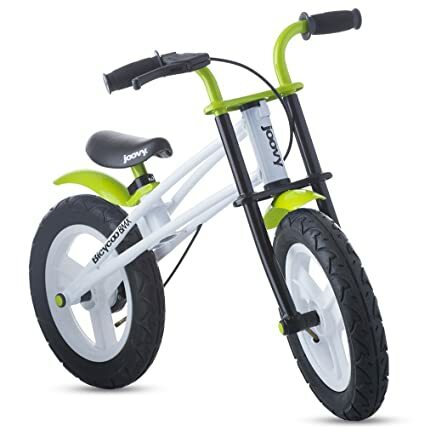 Ideal for the littlest riders just learning how to get around on two wheels, this push bike features a tall, easy to reach push bar on the back for parents to help guide their little one along. The bar is easily removable, so the bike can be used as a balance bike. 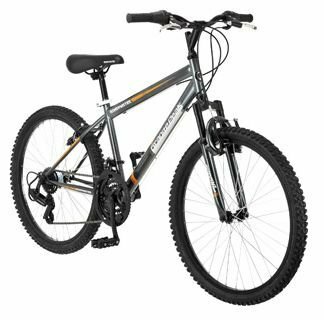 This rugged mountain bike boasts a durable steel frame and suspension fork to provide a safe and smooth ride. Choose from 18 speeds that are easy to change with a twist of the handle. 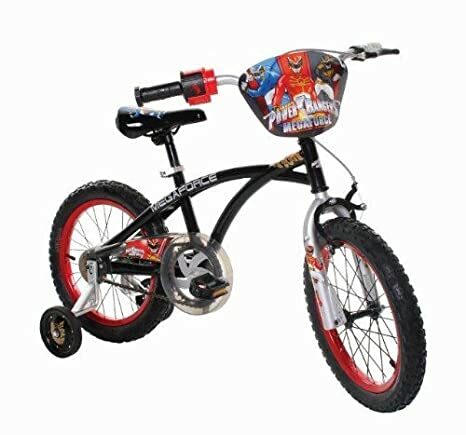 Get your little Cars fan all fired up with this bicycle featuring the film’s own Lightning McQueen – ka-chow! It even features a removable die cast car carrying case, ideal for storing and displaying your little one’s favorite cars. 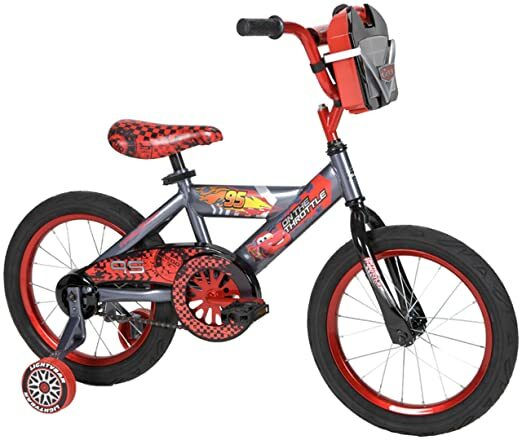 This basic boy’s bike is perfect for those just getting their start on two wheels and is decorated in vibrant colors and logos to help your little one stand out. 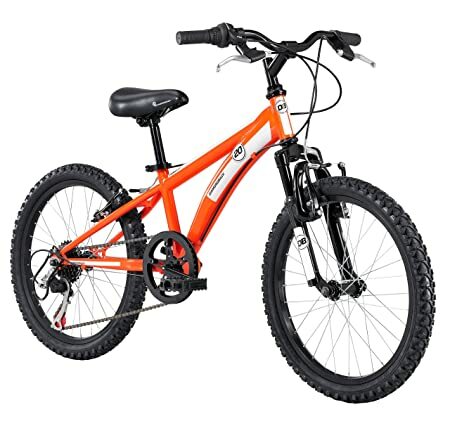 It features a durable steel BMX-style frame and easy to grip mushroom-style handles. This is one seriously cool bicycle. 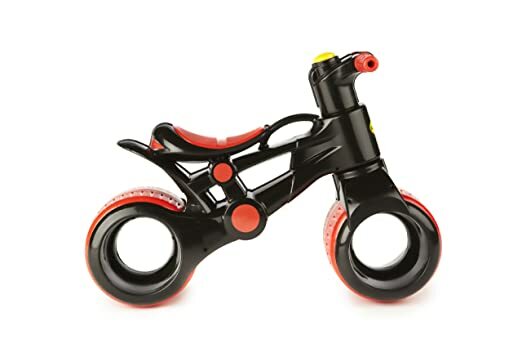 Made from a durable plastic, it’s a balance bike unlike any you’ve ever seen. Thanks to its unique design, it is suitable for use by children as young as 18 months. 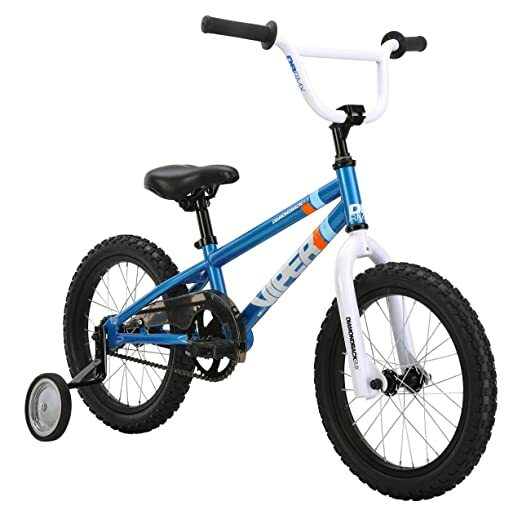 With a high tensile steel frame and padded BMX seat, this bike will provide your child with years of comfortable riding. Suitable for use by children aged 12 and up. 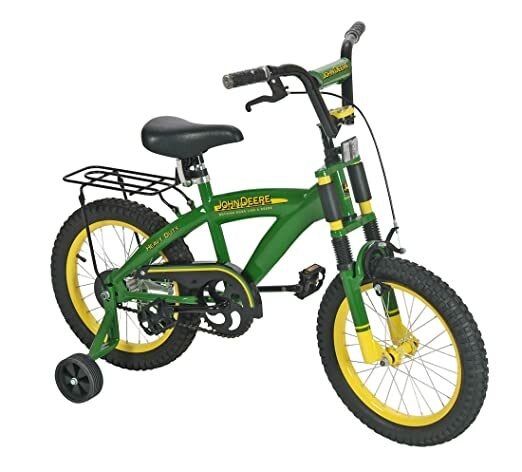 This durable steel framed bike offers a classic and comfortable way for your child to learn to ride and is easy to assemble. The quick release seat makes for easy adjustments as your child grows.